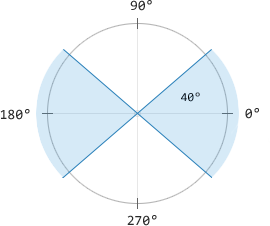 Notes on Slide Intent: The slide intent is an int between 0 and 90, and represents the degrees in the first quadrant of a circle that you would like to have mirrored on the X and Y axis. For example, if you have 40 set as your slideIntent value, the user would only be able to slide the pane by dragging in the blue area in the diagram below. Once intent has been defined, it will not change until the user releases. The event names listed above apply for the off method. A sample layout is found in demo/apps/default.html. - How do I make a toggle button? - How do I disable Snap.js dragging for my touch slider? All interactions on children elements of the element with the data-snap-ignore attribute will have their Snap.js events ignored. - I am using Push.js from Ratchet, I keep losing my events on my elements, how can I fix this? Simple. As wack as Push.js is (yes, it is in desperate need of attention as of v1.0.0), we can still solve this problem with it's only callback, 'push'. - Snap.js works on my Android device but i cannot scroll the content in my drawers, what gives? - transform: translate3d() breaks my fixed child elements, how can I solve this? This is a problem with Chromium and should be fixed soon. I would advise not having your direct children element set to fixed, that may possibly solve your problem. This code attempts to make your webapp's feel more "native". These other repos go well with it, too!